Governments in different provinces, states and countries have varied in their response to the need for more highly educated people. Some (as in Canada) have increased state funding to post-secondary education institutions to an extent that matches or even exceeds the increase in student numbers. Others (particularly in the USA, Australia and England and Wales) have relied mainly on steep cuts in direct state funding for operating budgets, combined with massive increases in tuition fees. Whatever the government strategy, in every university and college I visit, I am told instructors have more students to teach, class sizes are getting larger, and as a result, more and more classes are just lectures with little interaction. Indeed, statistics support this argument. According to Usher (2013), the overall full-time faculty:full time student ratio in Canadian universities increased from 1:18 in 1995 to 1:22 by 2011, despite a 40 per cent increase in per student funding (after inflation). In fact, a 1:22 ratio means much larger class sizes, because in universities full-time faculty spend only a notional 40 per cent of their time on teaching, and students may take up to 10 different courses a year. The fact is that especially in first and second year classes, class sizes are extremely high. For instance, one Introductory Psychology class in a mid-sized Canadian university has one full-time professor responsible for over 3,000 students. Tuition fees though are very visible, so many institutions or government jurisdictions have tried to control increases in tuition fees, despite cuts in operating grants, resulting in increased full time instructor:student ratios. Also, as a result of higher tuition fees and increased student debt to finance university and college education, students and parents are becoming more demanding, more like customers than scholars in an academic community. Poor teaching in particular is both visible and less and less acceptable to students paying high tuition fees. All of these strategies tend to have a negative impact on quality, if the methods of teaching otherwise remain unchanged. Contract instructors are cheaper to employ than full time professors but they do not usually have the same roles such as choice of curriculum and reading materials as tenured faculty, and although often well qualified academically, the relatively temporary nature of their employment means that their experience and knowledge of students are lost when their contracts end. However, of all the strategies, this is likely to have the least negative impact on quality. Unfortunately though it is also the most expensive for institutions. Teaching assistants may be no more than a couple of years ahead in their studies than the students they are teaching, they are often poorly trained or supervised with regard to teaching, and sometimes, if they are foreign students (as is often the case), their English language skills are poor, making them sometimes difficult to understand. They tend to be used to instruct parallel sections of the same course, so that students studying the same course may have widely different levels of instruction. Employing and paying teaching assistants can be directly linked to the way that post-graduate research is being funded by government agencies. The increase in class size has tended to result in much more time being devoted to lectures and less time to small group work. Lectures are in fact a very economical way of increasing class size (provided that the lecture halls are large enough to accommodate the extra students). The marginal cost of adding an extra student to a lecture is small, since all students are receiving the same instruction. However, as numbers increase, faculty resort to more quantitative and less flexible forms of assessment, such as multiple-choice questions and automated assessment. Perhaps more importantly, student interaction with faculty decreases rapidly as numbers increase, and the nature of the interaction tends to flow between the instructor and an individual students rather than between students interacting as a group. 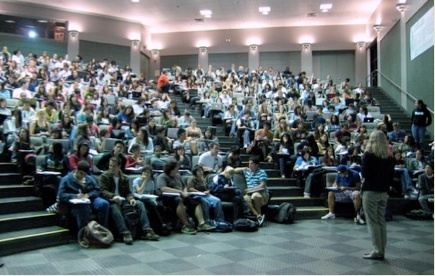 Research (Bligh, 2000) has shown that in lectures with 100 or more students, less than ten students will ask questions or provide comments over the course of a semester. The result is that lectures tend to focus more heavily on the transmission of information as class size increases, rather than on exploration, clarification or discussion (see Chapter 4, Section 2 for a more detailed analysis of the effectiveness of lectures). Increasing faculty teaching load (more courses to be taught) is the least common of the four strategies, partly because of faculty resistance, sometimes manifesting itself in collective agreement negotiations. Where increased faculty teaching load does occur, quality again is likely to suffer, as faculty put in less preparation time per class and less time for office hours, and resort to quicker and easier methods of assessment. This inevitably results in larger classes if full-time faculty are teaching less but doing more research. However, increased research funding results in more post-graduate students, who can supplement their income as teaching assistants. As a result there has been a major expansion in the use of teaching assistants for delivering lectures. However, in many Canadian universities, full-time faculty teaching load has been going down (Usher, 2013), leading to even larger class sizes per full-time instructor. In other employment sectors, increased demand does not necessarily result in increased cost if that sector can be more productive. Thus government is increasingly looking for ways to make higher education institutions more productive: more and better students for the same cost or less (see Ontario, 2012). Up to now, this pressure has been met by institutions over a fairly long period of time by gradually increasing class size, and using lower cost labour, such as teaching assistants, but there becomes a point fairly quickly where quality suffers unless changes are made to the underlying processes, by which I mean the way that teaching is designed and delivered. Another side effect of this gradual increase in class size without changes in teaching methods is that faculty and instructors end up having to work harder. In essence they are processing more students, and without changing the ways they do things, this inevitably results in more work. Faculty usually react negatively to the concept of productivity, seeing it as industrializing the educational process, but before rejecting the concept it is worth considering the idea of getting better results without working as hard but more smartly. Could we change teaching to make it more productive so that both students and instructors benefit? 1.5 The impact of expansion on teaching methods by Anthony William (Tony) Bates is licensed under a Creative Commons Attribution-NonCommercial 4.0 International License, except where otherwise noted.